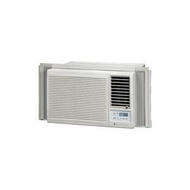 This programmable window AC delivers 10,000 BTUs of cooling power to cover rooms measuring up to 450 square feet. Eco-friendly R-410A refrigerant, an Energy Star seal, and a MoneySaver operating mode minimize the AC's impact on the environment. Other top features include 3 cooling speeds and fan-only settings, adjustable airflow louvers, an independent dehumidifier mode, and a washable antimicrobial air filter.